Well, it's been six months. The end of the laser liposuction saga. And here are my pretty satisfying results. Before we get to that I should reflect back to the beginning when I was told that liposuction was not for weight loss, it was body contouring. Six months later, I understand it on a more personal level. I've also read a few articles on the subject which, with my own experience, only solidifies the concept. I happen to be lucky enough to always hover around my happy weight point, 122. I can lose weight and come back to 122. I can gain it and come back down again. It's my body's happy place. I thought by removing about 5 pounds of fat would mean my new happy weight would be 118-119. Not so. My body, once again, went to its happy weight of 122. It's just that the fat is now evenly distributed throughout my body instead of all at my waist/belly. So yes, there was no weight loss, just a new look to my body overall. I went in for my final visit with Dr. Menon (Physicians Skin and Weight Centers), who, by the way, looks pretty terrific after her own lipo she had shortly before mine. 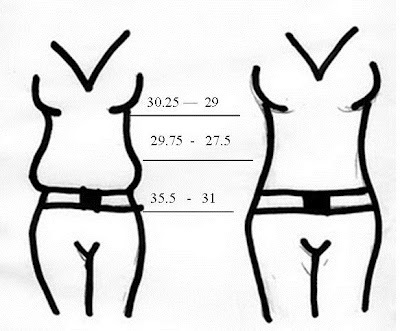 She had me strip and took my measurements. The first number is obviously the Before and the second number is the After. I especially like the results around the hips, -4.5 inches! 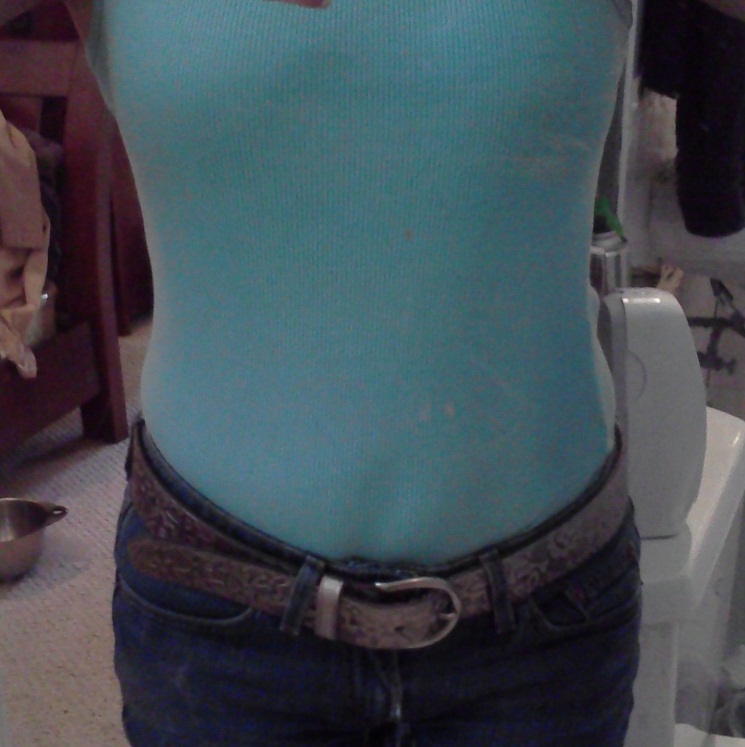 And here is a picture to demonstrate the no muffin top and the fact that I can happily and proudly tuck in my shirts! Now I still have a bit up front, but the doctor says that will need to come from tightening up my ab muscles, that there is just the right amount of fat left as the layer between skin and muscle. I'm thrilled with the sides though. And I definitely can't complain about the inches lost, especially around the hips! I want to end with a few comments about weight and self image. As I said, my body's happy weight is 122. My brain's happy weight is 115. The thing is, there is a difference between one's self perception and the perception of others. I look at my vacation pictures from last week and still see myself as heavy in the arms and face. I want to lose that heaviness! But the fact is, that's MY perception. Everyone who knows me says I look terrific and thinks I'm crazy if I say I could lose a few pounds. That's THEIR perception. When it comes to one's weight it is a constant struggle with OUR perceptions, not our friends'. I've decided that my body's happy weight is pretty satisfactory, especially when you consider that I can happily eat what I want and stay there. Losing those 5-8 pounds would be work! It's energy that I'm really not interested in expending. I'd rather enjoy my life and be happy with the fact that, to the world, I look great. This is a question that everyone needs to ask themselves when it comes to having a happy self-image and self esteem. Does it matter what your own skewed brain is saying to you or what all the people around you are telling you? How much energy do you want to expend? Yes, this is an odd final thought for the end of a liposuction journey, but an important one. Yes, I did take a short cut and got the lipo. But even though I'm still mentally thinking I'm a little heavy, I'm going to be happy, stop, and enjoy my results.